Consumer web is an area ripe for improvement here in Boston. It is no secret that there is a need for more angels willing to spread some funding around in portfolio fashion for early consumer web companies. The lack of angels is a result of too few big wins in the web space and therefore no groups of wealthy and successful web founders looking to angel invest. But it also seems that many of the founders that do achieve success here don't return to become founder/angels and instead stay at the acquiring company or become VCs. If you look at our small start-up world , you can describe it as a cycle in a similar manner to the carbon cycle or water cycle. For the system to thrive, it depends on replenishing the driving force, in this case founders, back into the start-up cycle to build another company. Again, this leak is specific to the consumer web start-ups here. Industries like storage, communication/wireless, robotics, and gaming have achieved a self sustaining momentum which feeds the pipeline of new start-ups. A lot of our best and brightest get stuck at the top of the cycle and stay at the acquiring company or become a VC. I am not knocking anyone's personal choice. Given the chance, I would be tempted to do the same. But when this happens the cycle is disrupted and energy is not reintroduced into the founder pool. The cumulative effect is that vitality and experience necessary to create the centrifugal force that will fling a big web success out of the start-up swamp and into the IPO light of day, is sapped every time a great entrepreneur does not return. It is somewhat a chicken and egg problem because we surely would benefit from another large anchor consumer web company growing and training the talent pool from which small companies spring. And yes, a group of wealthy founders and execs willing to seed invest in young web companies wouldn't hurt either. The question is, how does Boston get those large consumer web wins we need? From the top down or bottom up? Do we try to cherry pick that one potential win and nurture it to IPO? 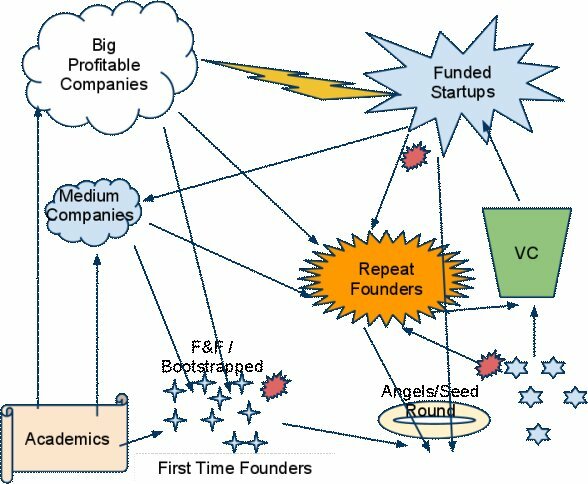 It seems the model that works is a numbers approach, (ie..Ron Conway) where funding many early stage companies in a basket fashion has the greatest chance of producing a big win. From the bottom up, our educational institutions are providing plenty of raw talent to be absorbed by the system. But without a thriving consumer web start-up environment and mentors and role models, they will go to a more inviting market for consumer web companies, to quench their entrepreneurial thirst. Its not all bad though, there are a number of web entrepreneurs and seed investors that are getting involved more at the early stage and things are improving. It just feels like progress is hindered ( and probably a cute little bunny croaks) every time a successful founder becomes a VC or continues working at an acquiring company well past the earn out period.